New, Unique, and Creative Home and Garden Accents. Our designs have the versatility to look as exceptionally displayed across your mantel as they do schooling along your perennial beds. Schools of Fish in the Garden unify unrelated elements in your landscape creating a sculptural presence larger than the sum of its parts. Fluid Garden Movement - Our design focuses on the visual –cerebral sensations of ‘flow’ that is most clearly seen by the way schools of fish curve in response to elements throughout an underwater landscape. Practically Built - The stoneware-clay sculpture, fired to 2,200-degrees Fahrenheit, is as durable as it is beautiful, and can withstand severe winter and summer conditions. 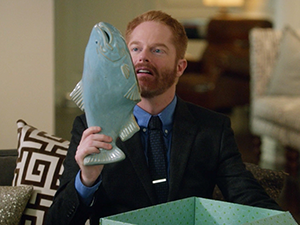 Wildy Popular - Our ceramic fish have been in multiple magazines across the United States as well as featured in an episode of Modern Family on ABC! Simple Installation - Installation in the garden is as easy as pushing two stakes in the ground. 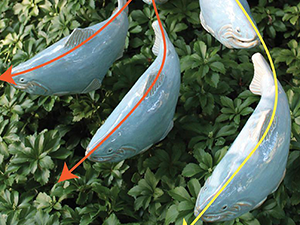 For metal wall sculptures, a specially‐designed 1‐inch hook positions them off the wall to allow light to play off the fish. By selecting a fish species found in your area, our designs deliver a regional relevance that so many people are looking for when decorating their interior and exterior spaces. Our designs have the ability to look as exceptionally displayed across your living room mantel as they do schooling along your garden beds. From our Ceramic Garden Koi to our Stainless Steel Garden Fish we have something for even the most discerning gardener. If you have any questions please feel free to Contact Us. 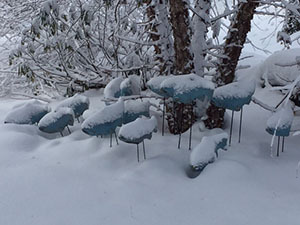 We appreciate your business and look forward to filling your garden with our ceramic fish! Set of 3 sky trout 2nds - Free Shipping!! !